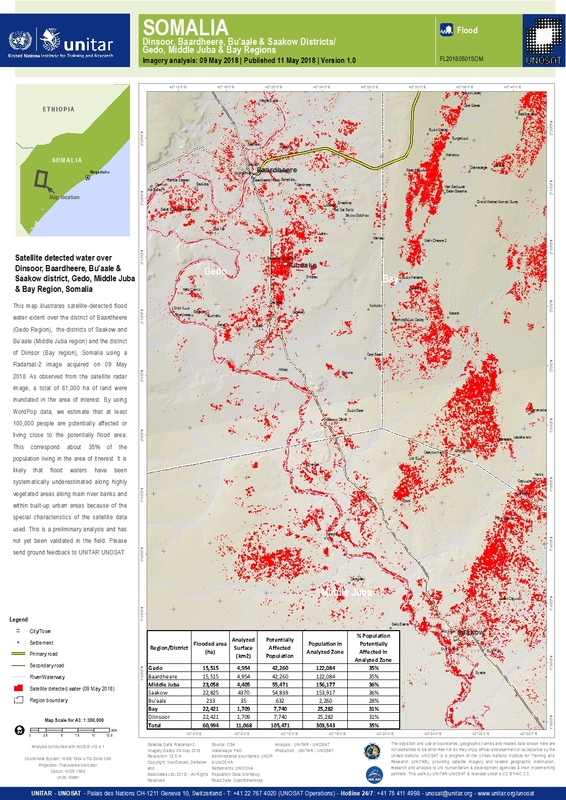 This map illustrates satellite-detected flood water extent over the district of Baardheere (Gedo Region), the districts of Saakow and Bu'aale (Middle Juba region) and the district of Diinsor (Bay region), Somalia using a Radarsat-2 image acquired on 09 May 2018. As observed from the satellite radar image, a total of 61,000 ha of land were inundated in the area of interest. By using WordPop data, we estimate that at least 100,000 people are potentially affected or living close to the potentially flood area. This correspond about 35% of the population living in the area of interest. It is likely that flood waters have been systematically underestimated along highly vegetated areas along main river banks and within built-up urban areas because of the special characteristics of the satellite data used. This is a preliminary analysis and has not yet been validated in the field. Please send ground feedback to UNITAR UNOSAT.